Spot sampling is usually done when sample results are needed for analysis. It is mostly used as quality control of a small sample of liquid or gas. Mechatest offers several sampling cylinder (or bomb) assembly solutions which are capable of quickly extracting the desired samples from your pipelines. Due to the high quality of our equipment, your research process will run smooth, fast, and, most important of all, be reliable. Naturally, spot sampling with our sample bomb connections also helps you to comply with environmental laws and regulations. And did you know that our systems are suitable for closed-loop sampling as well? Discover the full potential of our systems for your company today. In virtually every industry, the need for reliable analyzing equipment is ever increasing. And at a rapid pace! Ensure the competitive position of your company, call us today and further inquire about our specialized equipment. You can call Mechatest at +31 (0)15 – 310 51 83. Mechatest pre-assembled Spot Sample Cylinder Assemblies. 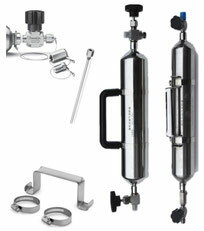 We can deliver a wide range of sample cylinder (bomb) assemblies from Swagelok, Hoke, Parker, Fitok etc. Sample Cylinder Carrying Handle, Stainless Steel Outage Tube Adapter, different needle valves and quick connectors. We can additional provide laser engraving with sample tag. No.